Mandee Rose | Posted on February 6, 2019 February 6, 2019 | 2 Comments on ibVPN Review 2019 – Does ibVPN unblock Netflix and iPlayer? What is it about Romania that produces great Virtual Private Networks (VPNs)? Well, first of all its data privacy laws are the strongest in Europe. They’re even better than those of secretive Switzerland. When the Romanian government implemented an EU directive on data disclosure that was framed to favor the authorities, a Romanian High Court judge threw it out. Added to that is a culture that still has ripples of a long-held Soviet leaning towards praising young people who study science and engineering. Furthermore, wages are among the lowest in Europe. Thus, Romania has a vast pool of highly educated technicians, along with totally legal data privacy. This is the secret behind the country’s VPN success. ibVPN is run by Amplusnet SRL, a little-known VPN provider based in the little-known town of Târgu Mureș, nestled on the edge of the Carpathian Mountains in Transylvania. It is the country cousin of its trendy, big city compatriot, CyberGhost. 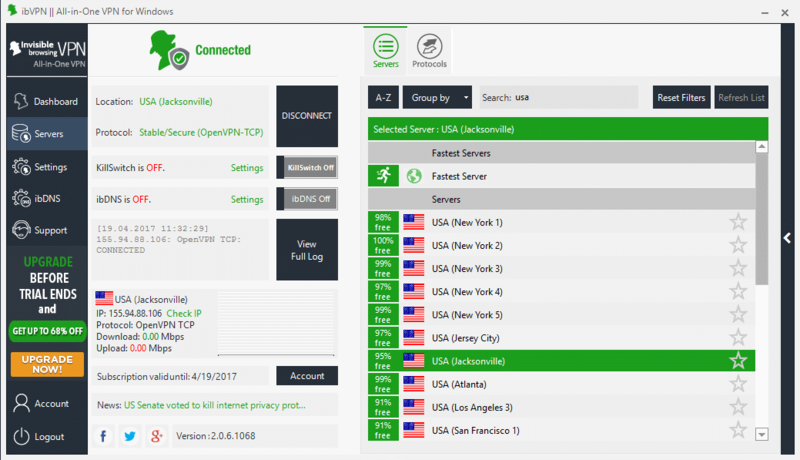 ibVPN doesn’t have the urban style of its better-known rival, but its technical capabilities and the abilities of its support staff are world-beating. Technically competent service with top quality support. ibVPN blends in a Smart Domain Name System (DNS) service to enable its customers to access a wide range of internet services. The company recommends that those in restrictive and repressive countries, or those who need total anonymity, like gamers and torrenters, should use the VPN services. Those who want to unblock geo-location restrictions, especially with streaming services, should use the Smart DNS service instead. The company has a complicated tariff. You should try the 24-hour free trial before committing to any plan. This time period gives you the opportunity to familiarize yourself with the interface and work out whether the service gives you what you most need from a VPN. The free version is the same as the Ultimate VPN option. 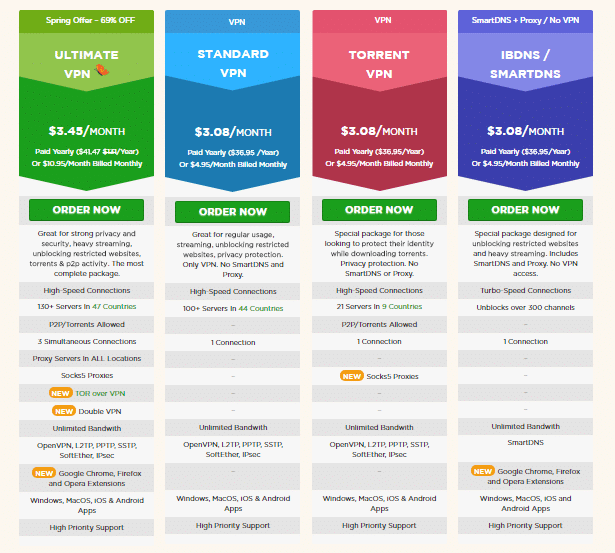 Although the plan comparison list on the pricing page doesn’t list it, the Ultimate VPN package includes the company’s Smart DNS service. Another omission on the pricing page is that ibVPN doesn’t mention its 15-day money-back guarantee. You will only discover this when you go to the next screen in the payment process. The company accepts a dazzling array of payment options. They claim to accept 50 different payment methods including paypal, bitcoin, american express and more. 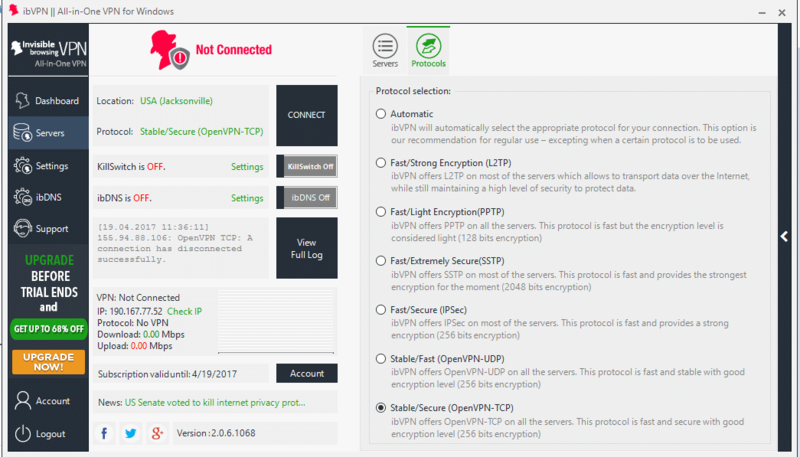 The application offers AES (Advanced Encryption Standard) 256-bit encryption on most of its VPN connections, no matter which VPN protocol is applied. There are some exceptions to this. If you switch to the PPTP protocol, you get 128-bit Microsoft Point-to-Point Encryption (MPPE) encryption. The SSTP option includes 2048-bit encryption. The IPSec setting gets you 256-bit encryption with that protocol. If you want to use OpenVPN, you have the option of specifying whether to channel the connection over Transmission Control Protocol (TCP) or User Datagram Protocol (UDP). As a rule of thumb, fast, interactive applications, such as online gaming, or Voice over Internet Protocol (VoIP) run over UDP. Everything else relies on TCP. The Smart DNS option doesn’t give you security, it just manipulates the source IP address that the server sees on your request for a file. The kill switch option in ibVPN is complicated. Most VPNs simply block access to the internet if the VPN is not engaged and the kill switch is turned on. With ibVPN, you have to specify the applications that this control is applied to. Security fans will love this feature, but general users will probably find it a lot of bother. A surprising absence from the list of security measures offered by ibVPN is automatic WiFi protection. However, if you have the kill switch correctly calibrated, this should help prevent your computer connecting automatically to nearby WiFi hotspots. Romania is a very good place for VPN services. There is no legal requirement for internet services to track the activities of their customers. Data disclosure requirements that were implemented across Europe to implement an EU directive were blocked by the courts in Romania. This means you get far better privacy with VPNs based in this country than in any other nation of the EU. Despite its location, the company employs a team of fluent English speakers in its offices. The support staff writes English so well that you wouldn’t know that you weren’t chatting with a native speaker of the language. Staff can also communicate in fluent French. 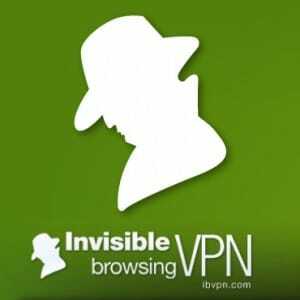 The VPN offered by ibVPN is easily detected by most streaming services around the world. This is why the double package of a VPN and a Smart DNS is so attractive. The company recommends that you use ibDNS to access streaming services and not the VPN. A Smart DNS is a proxy server. This is the same as a VPN, but without the encryption. The company recommends that you use the Smart DNS service for video streaming. I tried it with the BBC iPlayer and it worked, whereas the company’s VPN didn’t. Neither the VPN nor the smart DNS service got me into Netflix UK. In the USA I tried Fox, ABC and Netflix. They all detected the VPN, but I got in to each with the ibDNS service. The support operative I spoke to told me they don’t headline their ability to get into Netflix, because that company is constantly revising its geo-location blocks, which makes it a moving target. However, if you want to get into Netflix right now, ride in on the ibDNS. 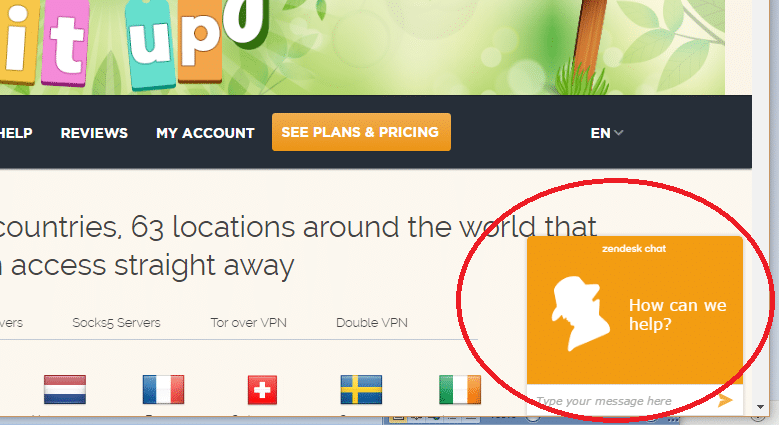 Many VPN companies offer a free version, or a short trial period. Often the free trial is a cut-down version of the full package. The ibVPN 24-hour free trial gives you full access to the Ultimate VPN package. To get the free trial, you first need to enter your name and email address in the Free Trial page, which can be accessed from anywhere on the site by clicking on the Free Trial button. Clicking on the button in the form gets you set up. 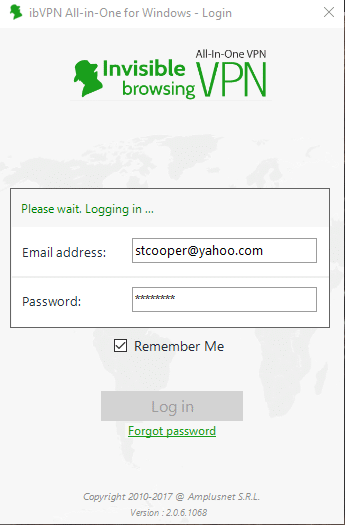 ibVPN sends you an email confirming the start of your trial. You then need to go to the client area, following a link in the email. 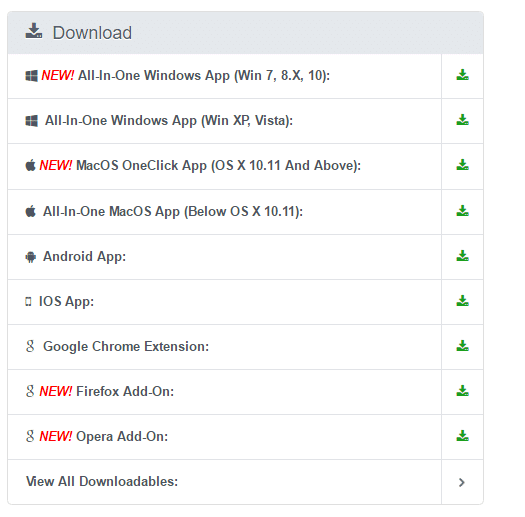 You can download the app from the homepage of the site without logging in, but don’t do that – the link there accesses an older version of the app. The download section is clearly visible in the Client Area. Choose the version for your operating system. Click on the downloaded file to run the install wizard. 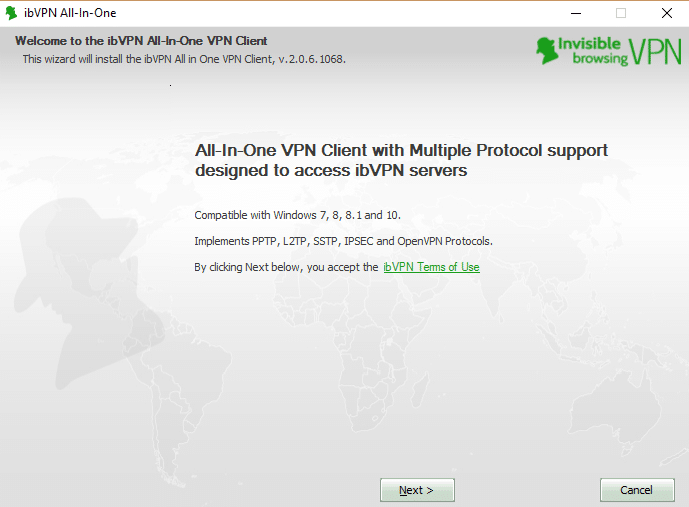 To run the application, click on the ibVPN All-In-One icon on your desktop. In its initial state, the app is very slim. Expand it out by clicking on one of the options in the left-hand menu. If you are returning to the app from a previous session, you will see the settings of your last connection, which you can just rerun by clicking on the Connect button. If this is your first time using the app, everything will be set to default settings. If you are not interested in tinkering with the settings, and you don’t care which server the VPN uses, you can click on the Connect button and use these default settings. To open up the server list, you need to click on the Server option in the left-hand menu. speeds, so it is worth playing around with the protocol options. If you click on the icon, it will open up the app. When you click on the Connect button, a small message panel will show system messages that explain the steps that the app is going through to connect. Once connected, the red graphics in the app turn green and a performance monitor appears in the lower part of the app. You access the Smart DNS service in the same app that operates the VPN. You can’t have both the VPN and the DNS service turned on together, so you first need to turn off the VPN connection. 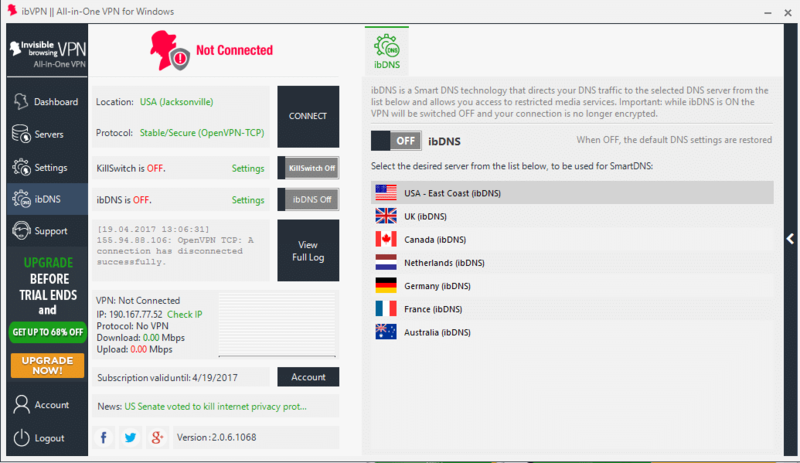 Click on ibDNS in the left-hand menu to get access to the Smart DNS service. You will see that the ibDNS service is only available for a few countries. You need to select the country that the streaming service you want to use is located in. To watch ABC or Fox, select the USA server; for the BBC iPlayer or 4oD, select the UK server. Click on the On/Off slider above the server list to turn the Smart DNS on. The messages in the panel on the left will indicate that the VPN is not turned on. If you check your IP address, you will see that it is still the same. However, your traffic is now being channeled through a proxy server, so when your request for a show or a movie arrives at the streaming server, you will seem to be in the right country. You can access streaming services in the regular way by typing their addresses into your browser, or searching for them on Google. 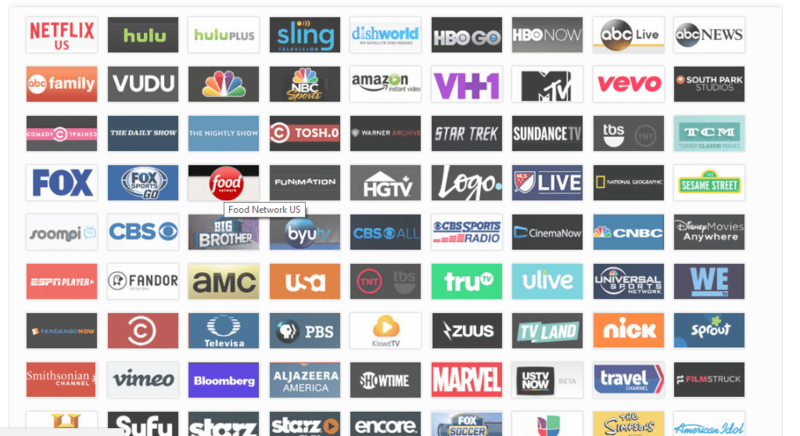 The ibVPN site also has a page dedicated to streaming services, with links through to a large number of sites. 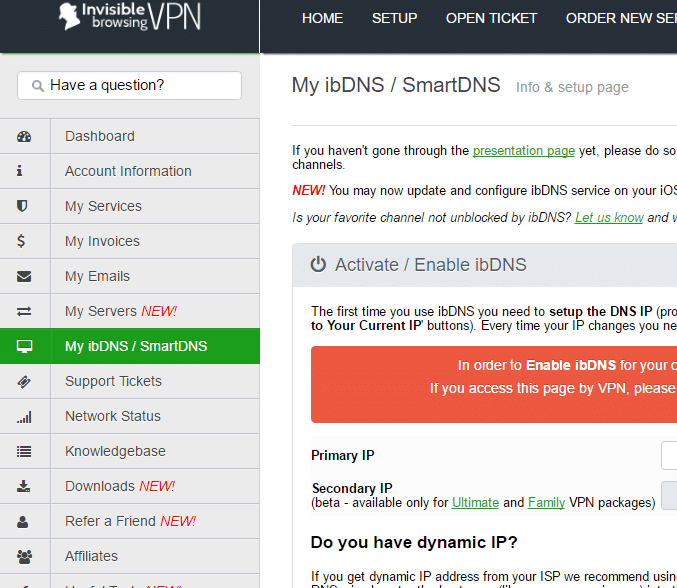 In order to get to the list, go to the “My ibDNS / SmartDNS” page from the left-hand menu in the Client Area. Click on the Channel List button at the bottom of the page. Click on the icon of the channel you want to watch and a tab will open in your default browser with that site’s address accessed. The ibDNS doesn’t bypass subscription services, so you can only watch these channels if they are free, or if you already have a subscription. The point of this feature is to dodge the geo-restrictions, not to dodge paying for premium channels. In order to glean all of the information needed for this review, I had to contact customer support. The ibVPN website has tons of information on it, but it isn’t very well organized, so I hadn’t discovered much of it. 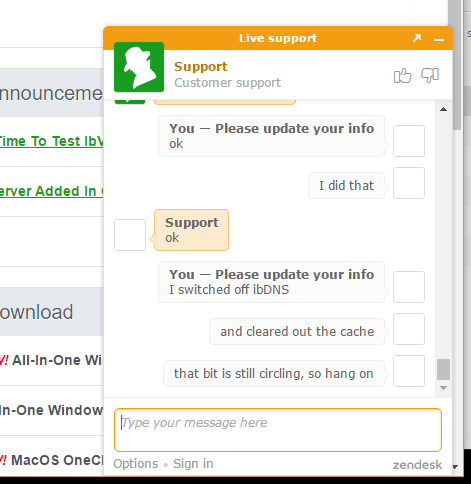 The different merits of the VPN and the Smart DNS service were explained to me in the support chat. You can raise a support ticket from within the app or in the Client Area of the site. However, why bother with all that when live chat support is available? Click on the yellow square at the bottom right of any page on the website to open a chat session. I spoke to Albert Nagy, whose English was perfect. Furthermore, no matter what question I threw at him, he came back with an answer almost immediately. He really knew the service inside and out. Albert told me that the support staff is online 24/7. However, I have been on the site a few times and seen a message that there was no one available – I guess they go to lunch or out for a call of nature from time to time! I am based in the Dominican Republic, which has terribly slow internet. One advantage of using a VPN in countries with poor internet services is that it can actually speed up your connection. You will see an example of this phenomenon in this test. The ibDNS server did speed up the line a little. However, the major benefit of the service was that it got me into streaming services that block access from other countries. 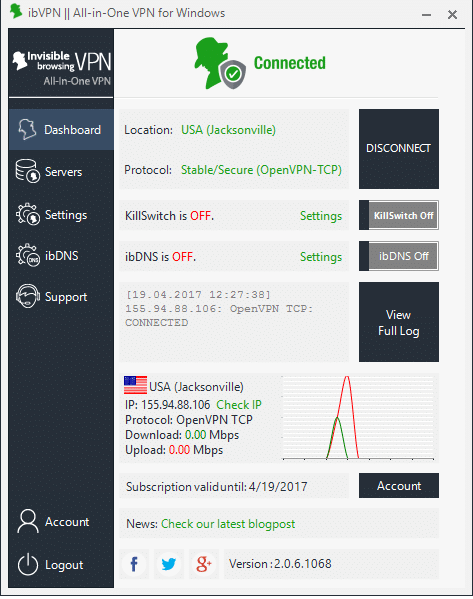 I turned off the ibDNS and engaged the ibVPN service with the server in Jacksonville. I specified OpenVPN over TCP. This improved the speed on my internet service to be more than four times faster than the regular connection. The speed test on a connection to London showed that engaging the ibVPN server in the UK got me fantastic results. I selected their Manchester server and specified OpenVPN over TCP. Should I Subscribe to ibVPN? The Ultimate VPN package offered by ibVPN has everything, and costs just a few cents more than the company’s other packages. The combination of the ibVPN service with the ibDNS is a winner. The service is a lot cheaper than many rival VPNs around the world and it performs a lot better than more expensive alternatives. It is certainly worth trying the free trial. Once you have tested the performance of the service from your location, you will be better able to judge whether it is worth paying to continue. Even then, you have 15 days to change your mind and get your money back. We will appreciate if you tell us more about your experience with ibVPN services.